This post is sponsored on behalf of Ghirardelli. All opinions are 100% my own. It’s May! I had no idea I would be so excited for a new month to roll around. May brings optimism and anticipation for sunshine, longer days and a slower pace. Why I think life will slow down in May is as much your guess as mine. But I think it all circles back to optimism. On Monday I was talking about value of time in our lives, especially when it comes to spending it with loved ones. I was thrilled when my friends at Ghirardelli asked me if I would create some fun Mother’s Day pairings with their chocolate squares, because it gave me a good reason to do some serious planning for a special day with my mom. In order to plan properly, I called my mom up and we chatted about what would make a perfect day together that involved food and chocolate. Honestly, with food and chocolate I’m not sure a day could be anything but perfect, but what we came up with really helped plan our day together. I can’t wait! A day with mom has to start out with breakfast. 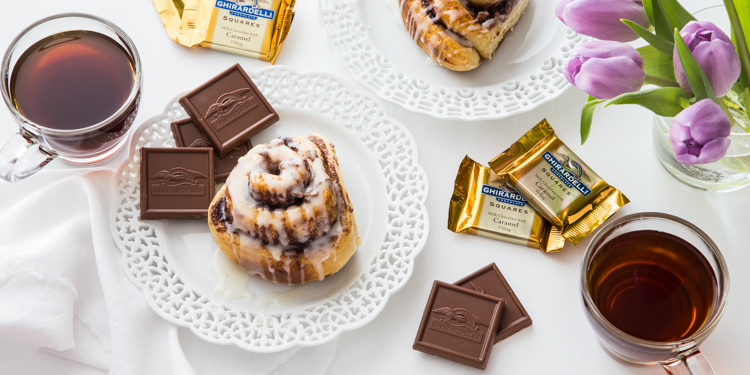 Jazz up your basic cinnamon rolls with pieces of Ghirardelli’s Milk Chocolate with Caramel squares rolled into the dough. The filling gets rich and chocolatey with a hint of caramel, making these rolls anything but basic. Served with a few cups of rich, dark coffee and I’m thinking this will definitely get us going for the day. After breakfast, I want to head to the Toledo Museum of Art for a bit of site seeing. My mom, being awesome as she is, has always indulged me by listening to my chatting about art. 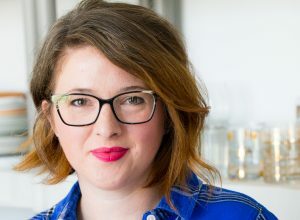 When I was in college and deep into my 18 credit hours of art history classes, she would always be the one I would talk to about the odd tidbits I learned about Michelangelo or a random European cathedral. 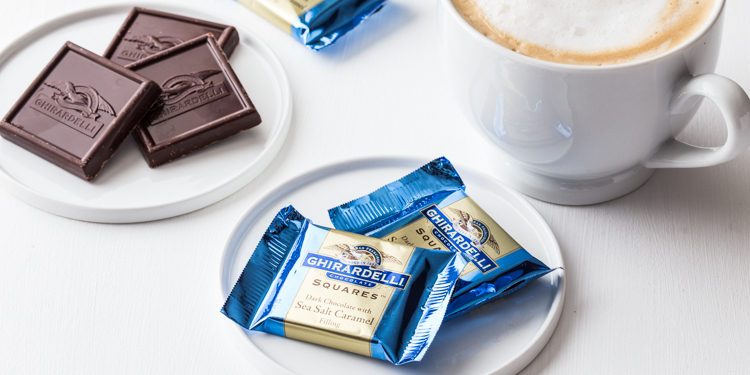 I’m thinking that a few of Ghirardelli’s Dark Chocolate with Sea Salt Caramel squares will go perfectly with a latte as we chit chat about artwork at the museum cafe. After the Museum, I want to head to the local greenhouse where we’ll pick out some flowers for the garden. Mother’s Day is always a good time to start thinking about planting. Although this year, frost is still a major concern, so perhaps we’ll just look. I don’t know, I don’t know. My mom is my gardening guru and every year I hope to absorb some of her knowledge purely by osmosis. A girl can hope. After our trip to the greenhouse (whether we come away with plants or not) we’ll head back to her house and whip up a light Spring lunch of some chicken salad on croissants. 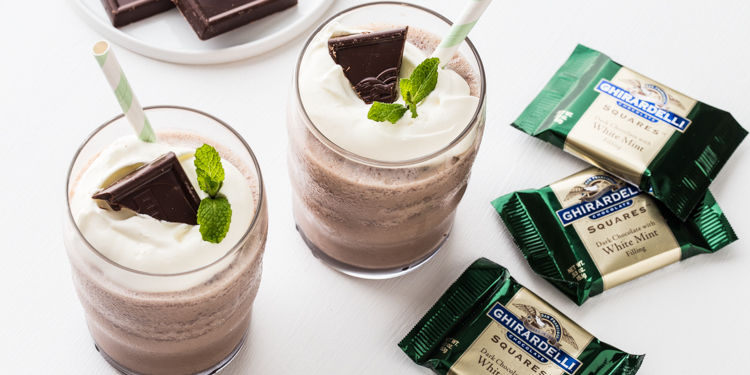 We’ll be sure to leave room to finish off our lunch with a sweet, mint chocolate shake featuring Ghirardelli’s Dark Chocolate with White Mint squares. Oh my gosh, these squares are sweet and light and a perfect finish to our lunch. If weather permits, I’m thinking a dinner on the grill will be awesome – first grilling of the year! What would be even better would be if my sister and sisters-in-law could join us for a bonafide girls night. 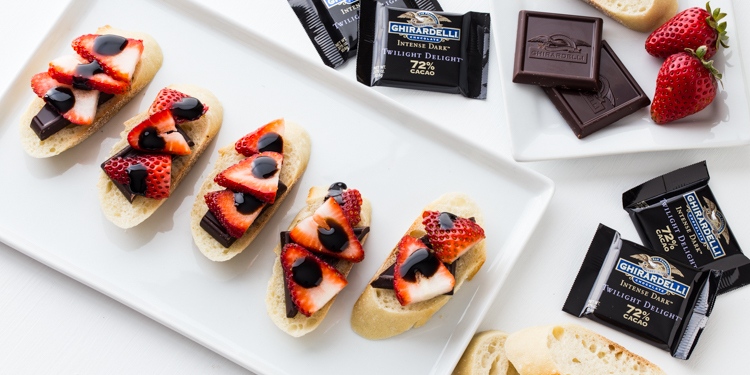 We’ll start off with some simple and sweet strawberry balsamic crostini with Ghirardelli Intense Dark Twilight Delight squares. Toasted baguettes topped with a piece of the chocolate, sliced strawberries and drizzle of balsamic glaze. The combination of sweet and tangy is so mouth watering. 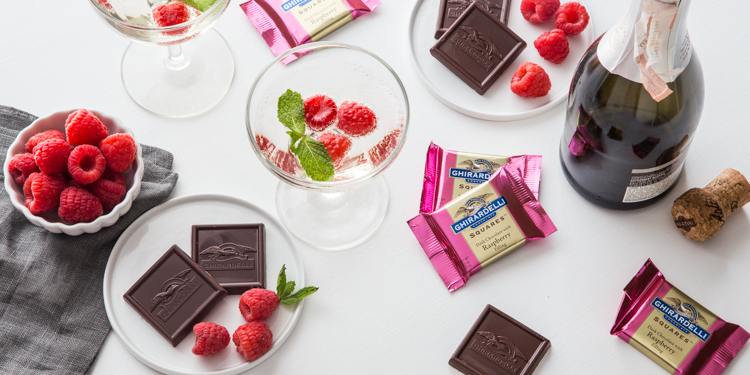 After dinner, we’ll settle in for a sweet bite of Ghirardelli Dark Chocolate with Raspberry squares and a simple raspberry mint champagne spritzer. Maybe a movie or crazy board game night (we’re board game people). Now we just need to find a day and make it happen. I seriously can’t wait! 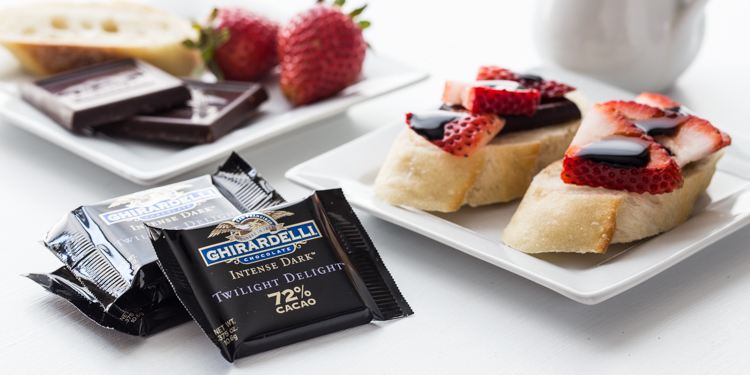 For more amazing Mother’s Day ideas visit Ghirardelli. Whatever your plans for Mother’s Day, I hope you and all of the mom’s in your life have an amazing day!